The State Police numbers may be used to report a fire, ONLY if a fire warden or forest ranger cannot be reached. To report wildfire arson call 1-800-987-0257 - The Maine Forest Service, Department of Agriculture, Conservation and Forestry. 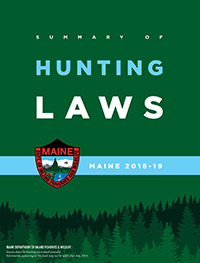 The Maine Department of Inland Fisheries and Wildlife receives federal funds from the U.S. Department of the Interior. Accordingly, all Department programs and activities must be operated free from discrimination in regard to race, color, national origin, age, or handicap. Any person who believes that he or she has been discriminated against should write to the Office of Equal Opportunity, U.S. Department of the Interior, Washington, D.C. 20240.